Easter is now a distant memory, children are back in school and true to form the sun has decided to shine! Over the past two weeks I hope, the ladies have been working hard finishing off pieces of work and updating their files because we only have officially 11 weeks left to complete year 1. Yes, two thirds of the way through and we still quite a few techniques to master. Transfer dyes being one of them. Now I have to say when I first tried transfer dyes I wasn't that impressed but having revisited these paints I see more potential the more I play with them. Basically the paint has the quality to be transferred to fabric in many different ways by using the heat of an iron. They come in powder form or already mixed in liquid and are ideally used on man made fabrics such as polyesters or rayons. When used on Polyester fabrics the colours are vibrant and strong, if you apply them to natural fibres they are duller and more subtle. Recently you can buy a solution called transfix, which you paint onto natural fabrics so that they take on the same bright colours that you gain from man made fabrics. There are so many man made fabrics that are produced to resemble natural fabrics such as silk although nothing can repalce the real thing truly, but they are half the price and easily produced. Some have a very high sheen, some with a slub, some see through, and also different weights which are suitable for different craft applications. Choosing fabrics can be a little daunting, with the choice available to us today. But when you are out and about, check out the fabric stores and get a stash of different types so that you can try and sample them to understand their properties such as the sheen, fluidity and strength so that you can purchase an appropriate fabric for your piece of work. Trying out different materials will help you to make the best decision especially if the piece of work is to have a function, no good choosing a crepe de chine for a shopping bag or a fine georgette for a winter coat. As you get to know different fabric types you will learn how their inherent properties lend themselves to certain projects. The one thing which is very strange about transfer dyes is their colours, from pot to paper the colour does not resemble it's true hue until it is transferred to the fabric! First you must paint the chosen colour onto a sheet of a4 photocopy paper or similar. Any thicker than this and the paint does not transfer very well. You can use the "dry" painted paper then in many ways. Painted papers at the bottom, the top row is how they turn out when transferred to a 100% polyester satin fabric. Doing a little trial before you begin is probably the best advice I can give! You can experiment with sponging, dribbling, using a brayer, spattering etc on your original paper sheet, this will give you different textures to your backgrounds, the paint is not as smooth as others and can be unpredictable but I think that's part of the excitement you will never get two the same for sure! Above I have used a stencil which I have made from 190 micron stencil mylar. I have used it as a resist which means I have put my piece of fabric on an ironing surface right side up, placed the stencil on top and then put the painted paper, paint side down and rubbed the iron gently over the paper using quite a high heat. The mylar will withstand the heat and the paint only gets to the areas where the daisies are cut out. You could also use a piece of card board or another piece of paper with a desing cut out. It takes a little while to transfer but keep the iron moving other wise you will get marks from the steam holes in the bottom of the iron transferring as well even though you will be using it as a dry iron NO STEAM ! Keep rubbing the iron over and lifting the paper to see how the transfer is progressing, when you are happy with the depth of colour you can stop. I have recently designed some stencils and they will be on our our website very soon! 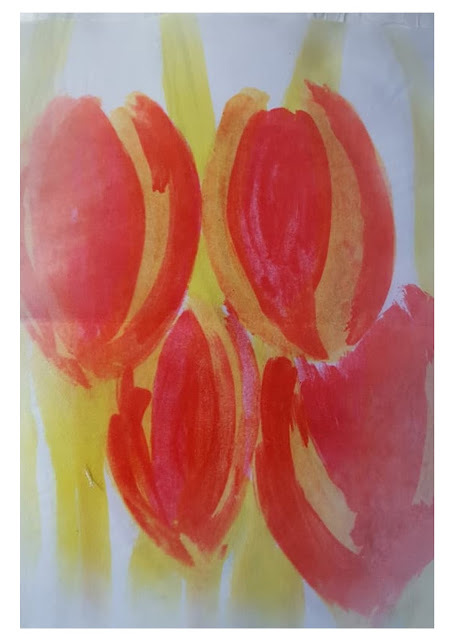 I really like this one, it looks very ethereal, and has been made in the same way as above but using a circle stencil, with 4 layers of coloured paper on top of each other each time moving the stencil so that the circles are not in the same place. This is fab, I just love it!!!! 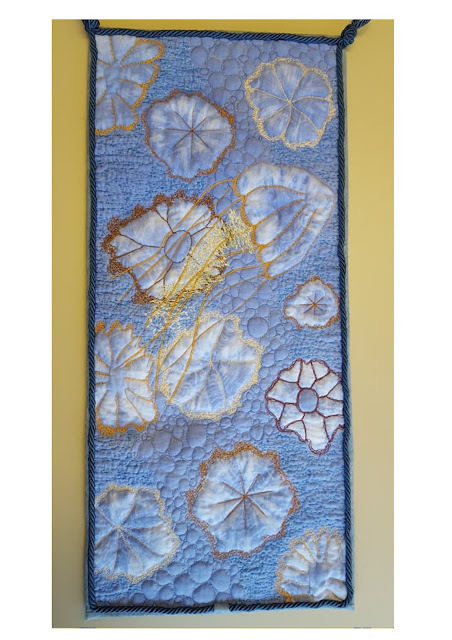 done in a slightly different way using the positive shapes from the stencil and layered and over lapped, which gives this great depth like looking into a pond. Below I have cut out a shape from the painted paper, you can see how roughly I painted it from the brush marks. The colour looks like a muddy brown but when transferred to the fabric it completely changes into a vibrant orange. From yucky to vibrant yellow it's like magic!!! 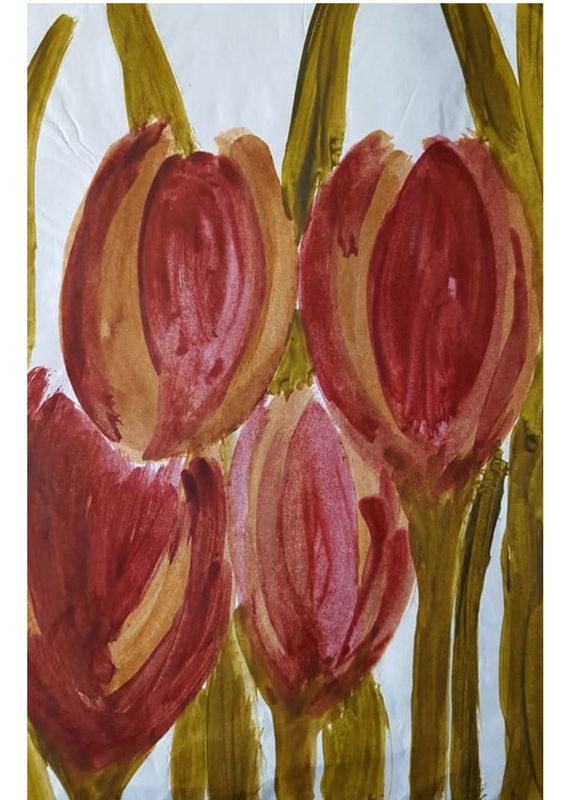 I painted some abstract tulips very roughly in red, yellow and lime green for the leaves and this is how it transferred to the fabric. Remember to flip your design, especially when using words! 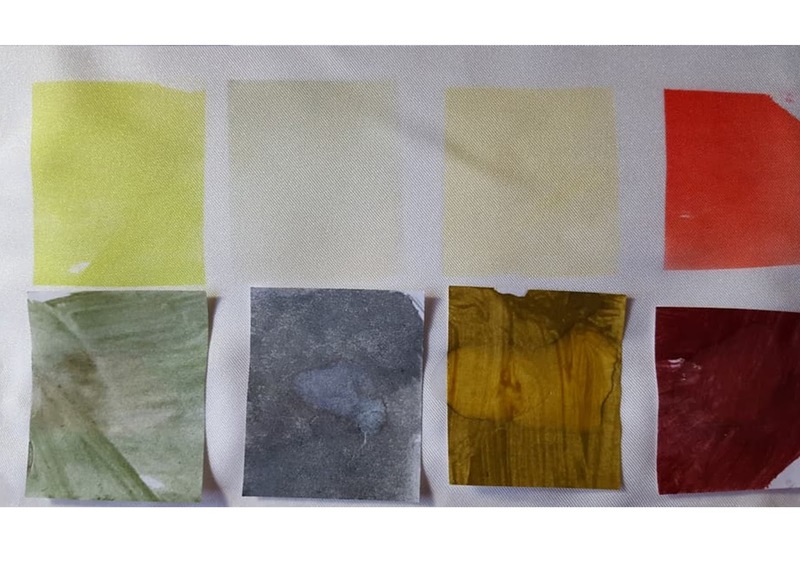 Next week we can see what the ladies have produced from their transfer dye papers, and hopefully time allowing I will have been trying out some more controlled ways of using these paints. Some outstanding pieces of work I think you will agree. For your chance to see these pieces make a date in your diary for Saturday 21st July when Busy Bees has it's workshop open day! All the City and Guilds work will be exhibited at Duffryn Community Centre, where you can view and sign up for City and Guilds level 1, there are limited places so if you are interested you can get in touch before by calling me at the shop 01633 810801 or email me at beccy@busybeespatchwork.com. The work shop open day is our biggest day of the year where you can sign up for day classes in all aspects of sewing crafts from Patchwork and Quilting to felting and hand embroidery, take the opportunity to come along and chat to some of the tutors who will be teaching over 2018/2019. It's a great day to come and chat to fellow stitchers over a cup of tea and a piece a cake and be inspired by all the lovely work that will be on display. In the meantime, make some time to sew put a side the washing and ironing for a while and set your self some time to do something creative. The benefits of doing something creative can really be very therapeutic, don't say you don't have the time! you have to make time even if it's only a couple of hours a week. Best stitches and looking forward to next weeks installment!